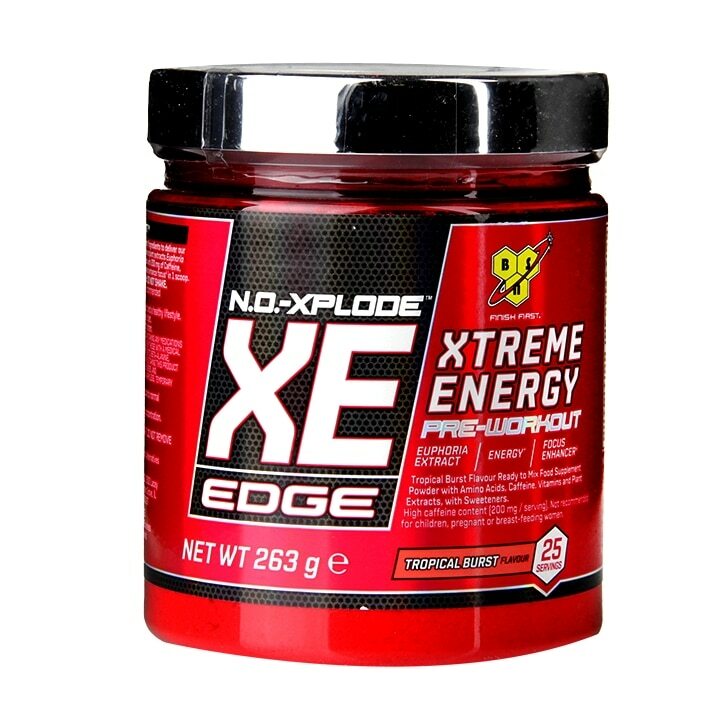 N.O.-XPLODE Xtreme Energy Edge is the result of a global search for a unique blend of ingredients to deliver our most intense pre-workout ever. Botanicals such as traditional Chinese plant extracts Euphoria Longana, Lindera Aggregata and Rhodiola Rosa have been combined with Caffeine, Beta-Alanine, Theanine and a Citrulline blend and vitamins and minerals to support energy* and enhance focus¥ in 1 scoop. Acids (Citric Acid, Malic Acid), Beta-Alanine, L-Citrulline, Acidity Regulators (Sodium Bicarbonate, Potassium Bicarbonate), Anti-Caking Agents (Silicon Dioxide, Calcium Silicate), Flavouring, Choline Bitartrate, L-Tyrosine, Acetyl L-Carnitine HCl, N-Acetyl Cysteine, Magnesium Glycerophosphate, Colour (Beetroot Red), Calcium Glycerophosphate, Caffeine, Euphoria longana Fruit Extract, Pyridoxine Hydrochloride, L-Theanine, Lindera aggregata Root Extract, Rhodiola rosea Root Extract, Grapefruit Bioflavanoid Complex, Grape Seed Extract (Vitis vinifera, seed), Sweeteners (Sucralose, Acesulfame K), Citicholine (Cognizin®), Glycerol Monostearate, Nicotinamide, Panax notoginseng Root Extract, Calcium D-Pantothenate, Cyanocobalamin, Cholecalciferol, Pteroylmonoglutamic Acid, Thiamin Hydrochloride. To be used in the framework of a varied and balanced diet and a healthy lifestyle. Food supplements are not to be used as a substitute for a varied diet. Do not exceed recommended daily dose. Keep out of reach of children.